Alex’s workspace is notable not just because he has a great-looking ultrawide and a spacious desk, but also because everything’s wall-mounted. The display is mounted to a partition wall the cables are run behind, there’s bias lighting everywhere, and yes, his PC is mounted to the wall too, in an acrylic case no less. All in all, it’s a really good look. 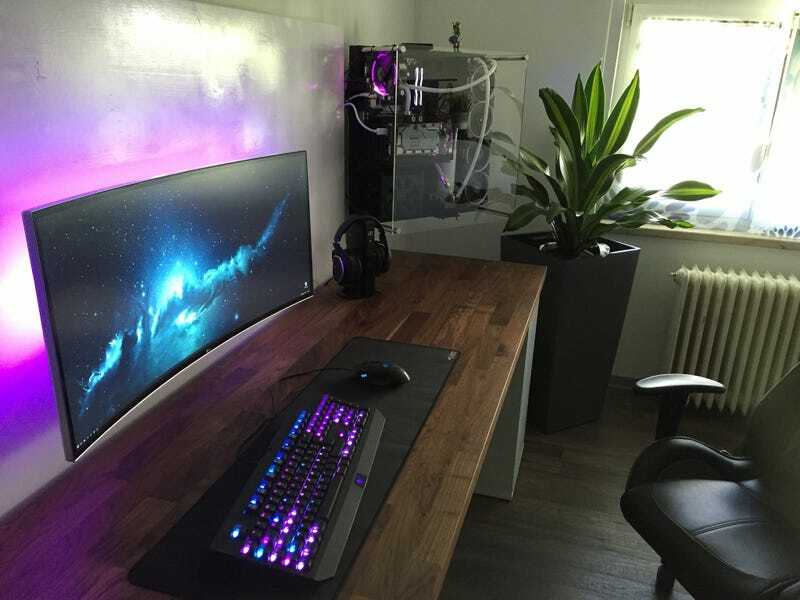 I’d love to know more about which peripherals he’s using and how that PC is built (he has some pretty awesome game screenshots in his Flickr profile, linked below), but we’ll settle for the eye candy right now. If you have a workspace of your own to show off, share them with us by adding it to our Lifehacker Workspace Show and Tell Flickr pool. Make sure any photos you include are at least 1280×720. Keeping them to 16:9 helps, too! Include a little text about the stuff you used, how you came up with the design, and any other relevant details. If your clever organization and good design sense catches our eye, you might be the next featured workspace!